A pantry is probably the most sought-after place in your kitchen. You use it all the time and that is probably why it also ends up being the messiest place in your kitchen. The pantry has everything and so your kids are using it, your husband is, your babysitter your maid, if you have one, and trying to keep it organized, seems like an impossible feat. I am sure you have had those moments where you find questionable things in the pantry or maybe the cereal is falling into the oats and the ketchup bottle is dripping, the pasta is all over the place because someone left the packet open, it is just a disaster. If you want to find a handy solution for this disaster, you better keep on reading. 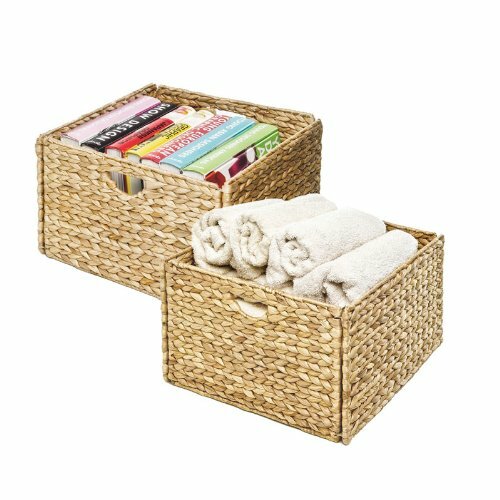 Seville Classics Hand-Woven Water Hyacinth Storage Baskets versatile 13.25" x 13.25" x 8"
How to go around organizing your pantry? The thing with pantries is that you can organize and then you can organize them again and again, but it won’t matter because by the end of the day or at most a week, it will be back to being a raging mess. That is because the pantry is used so many times in a day that it is impossible to keep everything check, besides different people are using it and everything seems to be out of place by the end of the day no matter how much you try to keep things organized. To keep your storage space in the pantry organized you have to have some good quality storage containers. Storage containers are your best friend when it comes to getting that pantry in order. Today there are a million varieties of storage containers that you can get in the market. All these containers are customized according to different needs of different people and their versatile pantries. If you want to store things alphabetically or if you just want some dividers, or do you want containers, you could have airtight containers, cylindrical containers, box containers etc. Basically, the point is that if you really want to get your pantry right, there are things out there that will have your back. This is probably one of the best storage containers when it comes to all the new inventions that are there in the market. This little spinner will be so very helpful if you are looking to store and save space at the same time. Do you know how you end up misplacing everything just to get that one jar of spice that you put on the back shelf, well, worry no more. With this turntable design, all you need is a little spin and you will have what you need right in front of you. It’s a great innovation that saves space, and time because you won’t be having to rearrange your pantry like 7 times a day. The design is both elegant and smooth running which will last for a good long time if you keep things in order. Other things that can be super helpful when it comes to arranging and organizing pantries are baskets and little bins. You can just flip all the things that are not breakable into the baskets and keep the baskets in your pantry. In order to make things even easier, try labeling your baskets and bins. So, for example, you could have all the cleaning supplies in one and the pasta in one and so on. Thanks to the wide variety you will find baskets that can utilize vertical space and if you want to add some dimension to your kitchen you can also find baskets that will hang nicely. These are another great basket option available on Amazon. These have a different look, so see what goes well with your kitchen’s design; you have an abundance of choice. Another great thing about these baskets is that they look super cute and homey thanks to their country style design. 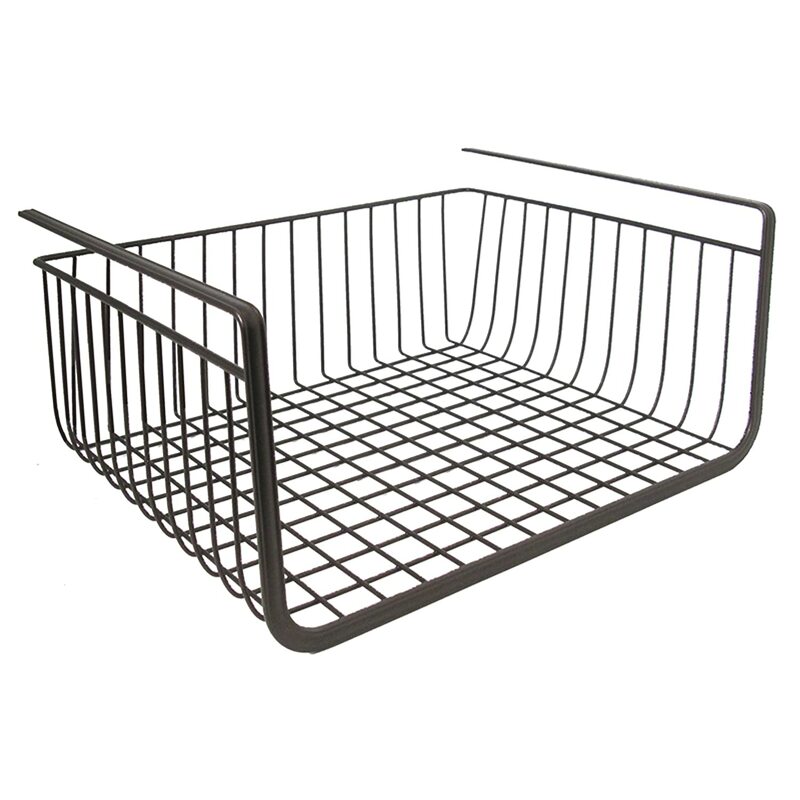 The baskets are also available in a number of different sizes so you can get exactly what you need for your pantry. 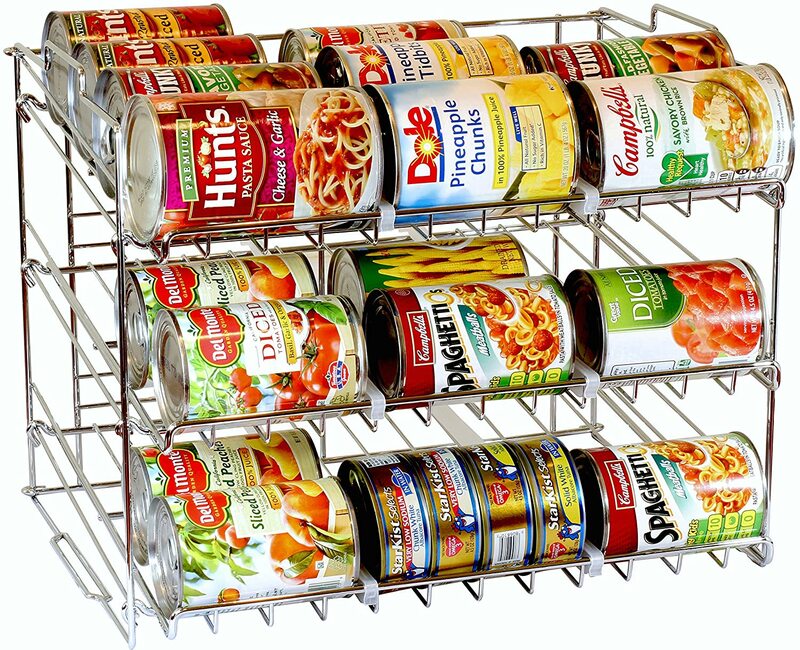 Who would have thought that you will be able to get your hands on an organizer that is specifically made to store cans and tins? Living in the 21st century, a fast-paced world, we could use all the help we can get, and can provide just that. Cans are easy to use and you can find almost anything, from vegetables to fruits to beans to puree’s in the form of a can. All you have to do is open it and use it to make a quick fix meal. While the cans solve one problem, they do add to the overflowing mess in the pantry, and I am sure you have been looking for the best pantry storage container to fix that. Well, look no further because DecoBros have you covered. This amazing stacking container is super awesome and super useful; you can place all your cans in there and forget about them, except for when you need them of course. The Supreme Stackable Can Rack will help you can stay in place and not cluttering the entire pantry area. Told you there was a pantry storage container for almost all your pantry problems! Once you get a hold of all these amazing pantry storage containers, it would be time for you start organizing. Empty your entire pantry and start anew, because otherwise, you won’t be able to get rid of all that mess properly. Now get those containers in, and label them if you need to, get your things into their rightful containers and then back into the pantry. Now that your entire pantry space is reorganized, you won’t be facing half the trouble that you usually might have a cluttered pantry. Enjoy your neat and tidy kitchen all thanks to the pantry storage containers.